MUSIC FROM THE MOTHERLAND | Aussies get the South by Southwest call up, Kylie and The Wiggles get Fame-ous and Mr Rogers bites back. Ouch! The roll call for the world’s premier music industry showcase has begun and already some Australian bands have gotten a start including Oh Mercy, Lanie Lane and Big Scary. We are of course talking about the South by Southwest (SXSW) Music Festival held every year in Austin, Texas. The 2012 event will be held in March and is a launching pad for many emerging bands and a chance for established artists to perform in tiny and random venues. One of the highlights from the 2011 festival was Jack White and Seasick Steve playing an impromptu busking performance on the streets of Austin. Every possible venue is utilised in the city with pub, bars and anything else where there’s opportunity for bands to turn their trade. Cloud Control, one Aussie band who have had a very good year since playing at SXSW, even played a set in a local pizza shop. Maybe you’re thinking big deal; a bunch of Aussie bands are playing in America and we’re here in the UK. Well people — it is time to get excited! After SXSW, traditionally the bands cross the Atlantic to play at the UK equivalents at Brighton’s Great Escape and Liverpool’s Sound City. Not to forget the legendary Aussie BBQ in London where this year we had The Jezabels, Little Red and DZ Deathrays rocking the Cargo Bar for Australian music fans. Hopefully then, after their American trip, we’ll have Oh Mercy, Lanie Lane, Big Scary and any other bands added to the bill hitting up our doorstep. See, now you’re excited. We’re just around the corner from the ARIA awards and we’ve been busy speculating on who’s going to take out the gongs. Our tip is on Gotye to win, well everything. In the meantime the ARIA folk have announced this year’s inductions into the ARIA Hall of Fame and it’s a high quality list. The honour has been extended to children music superstars The Wiggles and everyone’s favourite pint size pop star Kylie Minogue. The Wiggles are celebrating 20 years of entertaining toddlers with their infectious music and lyrics about doing the mash potato, red cars and a friendly dinosaur named Dorothy. Ms Minogue shouldn’t need much introduction but has led the way as a world famous pop icon who still fills out arena upon arena of eager music fans. Between the two acts they’ve been nominated for 51 ARIA awards, the Wiggles 15 and Kylie a staggering 36. They’ll be in pretty good company with former inductees including John Farnham, Icehouse, INXS and Slim Dusty. One hell of a party. Music reviewers and musicians have a bit of love-hate relationship. We, the music reviewers love them, they often hate us. Actually there’s more to it than that and in our perfect world we all exist in perfect harmony. Musicians receive good reviews and they receive bad reviews. Reviewers give positive and negative ones, well apart from the truly cynical ones. 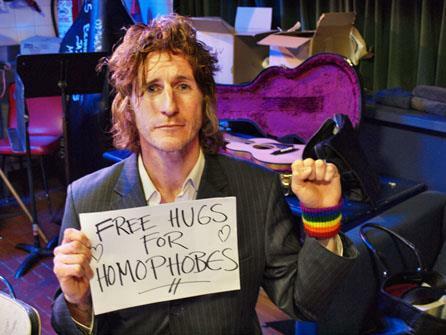 Lead singer of You Am I Tim Rogers wouldn’t be a stranger to mixed reviews. With the band and as a solo artist he’s no doubt received all different kinds of responses. But it seemed enough was enough for Mr Rogers after a particularly scathing review from a Townsville reporter recently when You Am I were supporting Cold Chisel on their national tour. The piece launched into Tim covering everything from his on stage antics, interaction with the crowd and his liberal use of naughty words. The reporter even questioned Jimmy Barnes’ sobriety when during the Cold Chisel set Tim was back on stage and Jimmy told the crowd how much of legend the man was. Now really, that’s a bit harsh. This sort of dressing down would offend most people. To his credit without launching a personal attack on the writer Tim did write into the paper disputing some of the observations in a well-crafted, witty letter which made us laugh. Especially his ending which he stated there is no reason to “feel sorry for me, because I’m doing, and have done for 22 years, music. For which I consider myself the luckiest tool around.’’ Well played sir.